While developing productive forces and immensely increasing material wealth, China needs to gradually secure fairness and social justice, Chinese Premier Wen Jiabao said in an article released on Monday. He called them "two interrelated and mutually beneficial tasks" that will run through various stages of socialism for a long period. In the article, which is about historical tasks in the primary stage of socialism and China's foreign policy, Wen said without sustained rapid growth of productive forces, it's impossible to finally secure fairness and social justice that lies within the essence of socialism. Without gradually promoting fairness and social justice in step with development of productive forces, it's impossible to bring the initiative and creativity of the whole society into full play and thus impossible to secure sustained rapid development of productive forces. The essence of socialism is to "emancipate and develop productive forces, eliminate exploitation and polarization and eventually realize common prosperity", Wen quoted the late Chinese leader Deng Xiaoping as saying. Wen said that "China is and will remain to be in the primary stage of socialism for a long time". The primary stage is an "underdeveloped" stage characterized by underdeveloped productive forces and a socialist system that is still not perfect and mature enough. He said China's socialist market economic system is till not perfect enough. The democratic and legal system is still not perfect enough and there still exist social injustice and corruption. The socialist system is still not mature enough. 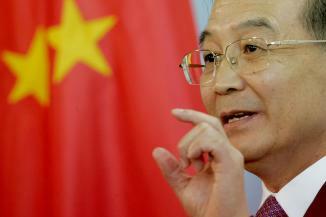 He said today, China is still far from walking out of the primary stage of socialism and remains a developing country. Wen said that China must encourage reform and innovation in it drive to become more open and modernized. Wen said that China shall develop the democracy in its own way. The socialist system is not contradictive to democracy, and a highly developed democracy and a complete legal system are inherent requirements of the socialist system and an important benchmark of a mature socialist system. The country has the full capacity to establish a nation of democracy governed by laws within the framework of socialist system, Wen said. We've got gooks here who are a fifth column. Time to deport 'em. I like these words. I like them a lot. And let me tell you something Trevor, I am starting to really like this blog. I am posting this as a blog article over on the BEINGHAD Times [http://bhtimes.blogspot.com]. There is a lot of talk out there about China's "Just make the deal" foreign economic policy. They have no particular issues with whether or not anyone has the USA's permission or not. Great post. Are Californians Smarter Than Kiwis? "National Question" 19 The "Weasels"